ZSL London Zoo underwent a massive redevelopment to build a brand new £3.6 million enclosure for their two endangered Sumatran tigers. The "Tiger Territory" project aimed to inform and inspire, while also helping fund ZSL's tiger conservation work in the field. They asked us to create a "tiger territory" unit to display their tiger merchandise in the London Zoo gift shop. 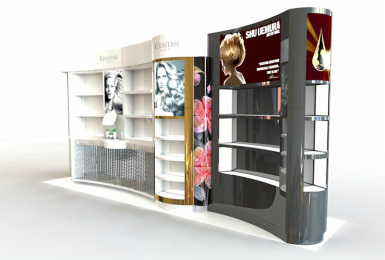 Our in-house team of designers created this stand with maximum display space and beautiful graphics. We incorporated LED lighting and interactive features to promote the products and engage visitors. We also converted an existing 6m exhibition trailer into a merchandise unit for use inside the zoo grounds. This acted as an extension of the existing shop to increase stock capacity. The entrance area was covered to create a sheltered space for freestanding display items and solid wood from sustainable sources is used where possible. The trailer is finished with a premium feel. If you are interested in commissioning an exhibition stand similar to the the ZSL shop display stands above, then please fill in the enquiry form adjacent or ring us on 01732 740370. Our team of expert designers and craftsmen will work with you to create your perfect interior display.